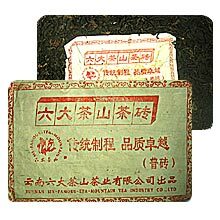 Zhuan Cha means "Brick Tea", so named as the tea leaves are compressed into the form of a brick. The amber-colored liquor of its infusion is full-bodied, and yet so mellow and smooth that you would feel as if you are drinking milk when you drink it. Good for multiple infusions. Our Zhuan Cha is from Six Famous Tea Mountain, one of the most popular brand in China at the moment.